The winning factor in every corporate event is the entertainment! How do you find the right one? We’ve put together five tips to help your corporate event stun with the perfect entertainer! Entertainment is what keeps a corporate event lively! Hiring the right entertainment act can be the reason your event is successful! The process of finding the right entertainment is an art. There are decisions to be made, planning to be done, and entertainers to be hired! Corporate entertainers are in abundance, but which one is the right fight for your audience or your theme or your boss’s taste? It definitely isn’t easy but that doesn’t mean we haven’t broken it down for you! Five small tips from us can be a giant leap for corporate entertainment! Don’t look further than Mark Crocker for your corporate entertainment! Your corporate entertainment is mainly to keep the audiences attentive so if it isn’t chosen according to your audience’s taste then it just defeats the purpose. Assessing your audience can give you the best idea of what your corporate entertainment should be! Comedy acts with popular artists like Mark Crocker can actually be one of the safest options for any audience! Age groups are important. Corporates usually have employees and employers of mixed age groups. Your corporate entertainment idea should be one which suits the taste of the older and younger employees alike. Stand up comedy is usually loved and appreciated across all age groups. You could even have a dance show or a light show. The extra element in your event is what will set it apart from the many corporate events conducted every year. Pull all the stops but also know when to stop. You need to present an event which the attendees will not forget but also keep them on the topic! Knowing just where to draw the line is very important! Check everything! Even your entertainment. Comedians like Mark Crocker usually showcase a sample of the set before the actual performance. This can help you modify content to your needs and ensure that it matches your demands. It could help you avoid any unexpected mishaps! If your show starts off on the right note and then buries itself in the dust later on because you don’t have the right audio visual equipment to support it, it could get really embarrassing. Contacting your corporate entertainer and ensuring that you are equipped for their act and any other event on the agenda can even help you ensure things don’t spiral out of control! Corporate entertainment needs to be appropriate in its presentation and delivery. Hiring professionals and going with ideas which have worked in the past such as comedy are great paths to take. 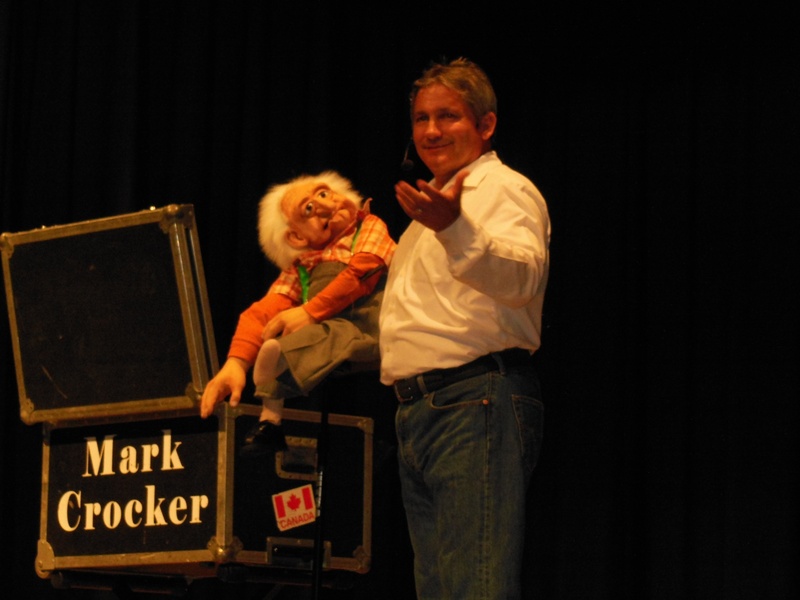 Mark Crocker, a comedian, adds something extra to his act with ventriloquism! This means you can add something in your event to leave the audience with a twist while playing it safe! Throw twists the safe way with Mark Crocker! Schedule your event with us today! A good cause deserves a good entertainment! Charity fundraising events don’t always have to be boring! Need ideas to add a twist to your event? Read on to find out how you can do just that! Charities are done everywhere, usually with causes which are of great importance. Every organization needs funding to function, to propagate their methods, activities and agendas so that they can make a difference in the field they have created the charity for! Charity fundraising events are usually a very somber affair. These days, however, people tend to spice it up with a few acts from comedians and ventriloquists like Mark Crocker! Your audience will definitely be more generous to shell out their hard earned cash when they are laughing uncontrollably! A good time means a good donation! Charity Fundraising is happier and better with Mark Crocker! Book your appointment today! Donors are human. And just like every human, too much serious talk can make them lose interest in the subject thereby making your event just another money hungry case. If you really want to grab their attention, make them want to shell out, you need to find a sure fire way to do it! Standup comedy and ventriloquism has definitely proven to be a winner! 5 Reasons to choose comedy for your charity fundraising event! Any charity needs to let their donors and benefactors why they came into existence, what they work for, their wins, their achievements and more! But preparing a slide and rattling through a long list can make your audience less interested. Telling your story in a humorous way, with a set you have seen over, adjusted to your taste, however, can keep your audience engaged and still get the point across just the way you want! This even helps you highlight the important points in the right way. When your audience is attentive, they retain more, they respond more, and they feel more. Donors need to appreciate and understand your cause, they need to feel connected to what you stand for, what you work for! Humor keeps them engaged and also helps them relate! The best part of hiring a comedian like Mark Crocker for your charity fundraising event? You get to stand out from the other charities! While everyone is being monotonous and serious, you get to bring joy and yet stand strong on your ideals! Your event will definitely be the talk of the town and get you more donors! Charity fundraising ideas are aplenty. Finding one which works, however, is not that easy! But comedy? Laughter? This works. Everybody loves happiness and that is exactly what Mark Crocker brings to the gathering! Make your cause count and gain more for your cause the fun way! Put the FUN in Charity fundraising with Mark Crocker! Call now to schedule your event! Make your event stand out and attract the maximum donations! Raise more with the right fundraising entertainment ideas! Find out how! Fundraising needs to be fun! A serious cause needs to be put in the limelight in just the right way to help attract the right kind of donors to it. With more and more ideas coming up for fundraising, how can you be sure that your event will stand out? Well, the simple answer would be to do something not everyone thinks of for your fundraising event! And don’t worry, you don’t have to wait for the light bulbs to go off either! We have you covered! Below is a list of the five most popular methods of making your fundraising event a magnet for donations! Contact Mark Crocker today to light up your fundraising event with laughter! Humor, laughter and fun are great ways to get your audience interested in your cause. Why wouldn’t somebody want to back an organization which knows how to be captivating? Standup Comedy is a great way to get the interest of possible patrons be it young entrepreneurs or established seniors! Add to this a twist with ventriloquism and you have a fun fundraising event which people are lining up for! 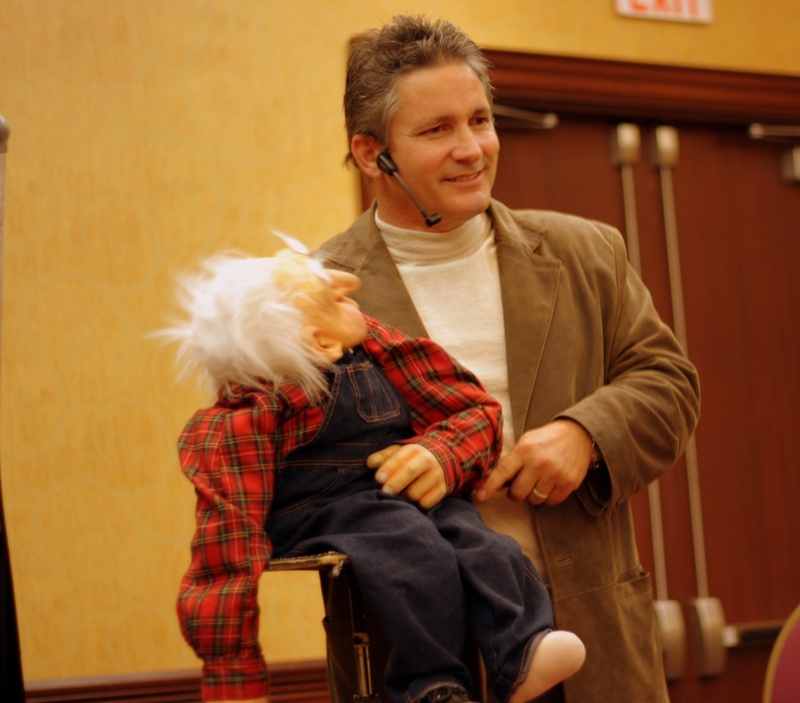 Comedy and ventriloquism are one of the best ways to engage your audience while still maintaining the importance and urgency of your issue! With professional and famous artistes like Mark Crocker, you can ensure that your event gets the spotlight it needs with the assurance that your message is being broadcast and people are actually listening to what you have to say! Engaging your audience in a trip around the city with cause related clues which would eventually lead them to a buffet with soft music or a comedy show can also get your possible patrons to experience and relate to your cause as well as give them a reason to remember and talk about it, thereby expanding your reach! A talent show can get more patrons for you in the form of participants as well! A city wide talent show could help you raise funds for your cause with a promise of fun, entertainment and interaction to your audience! It could even help you raise awareness about your cause on a larger scale! Another big hit with audiences who are likely to be valuable donors to your cause are themed parties! You could set up a hall with a theme which works well with your cause and hire comedians like Mark Crocker to add more life to the party! It could give your fundraising event just the hint of mystery and fun it needs! In the seriousness of the cause, most of us forget the importance of creating the right image for our donors. With the right entertainment idea for your fundraising event you can get the message across and also keep your donors hooked to your organization! Raising funds is easier and happier with Mark Crocker! Schedule your event today!